I got to visit the wonderful capital city and largest city of Colombia, Bogotá, twice in one year! Once was for a school trip, upon which I got to meet my amazing VML colleagues in that city. Then, there was a follow-up visit that summer to help my colleagues in that office launch a practice. What a cool opportunity, and I was absolutely honored to be a part of it. Below are my experiences and images from the two trips. This blog is mostly based on my second visit, but I have peppered in some stops from my first as well. Some were so great that I did them both times. Is it Safe to Visit Bogotá? 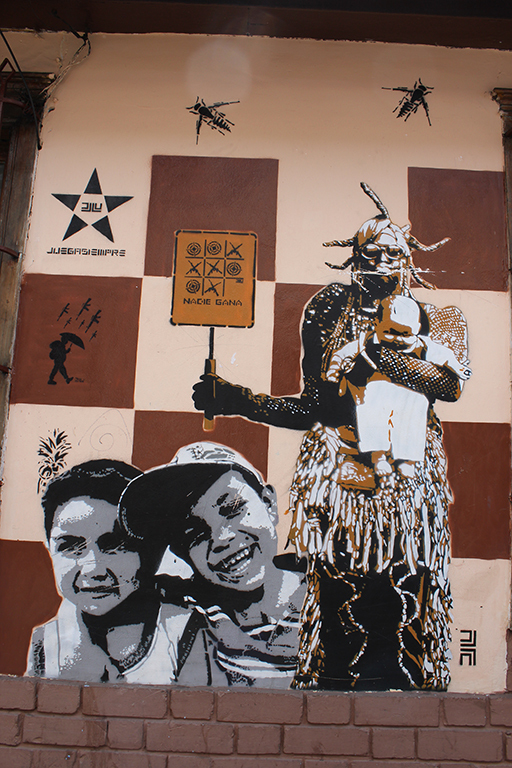 The question I get most often is whether visiting Bogotá is really “safe.” There is a lot of history around the drug trade and violent conflict with FARC rebels since the 1960s that Colombia has had a hard time trying to shake. The country has made great strides through ceasefires and peace talks in the last several years, and any residual conflict tends to be deep in the most rural parts of the country. 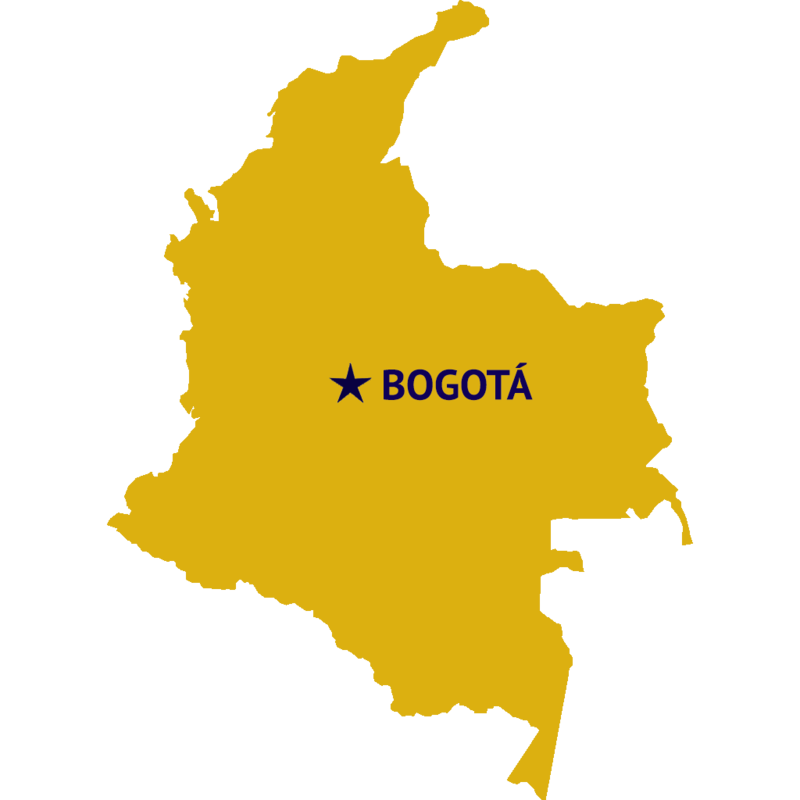 Bogotá is the commercial and financial hub of Colombia. 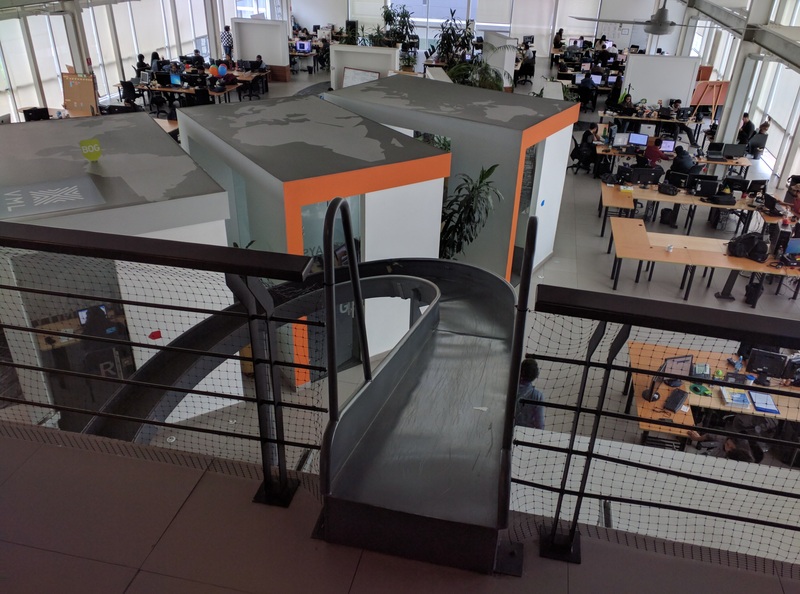 I visited the Invest in Bogotá! office as part of the educational trip, and they shared a lot about the economic development of the city of Bogotá, the impact of peace on their prosperity, and the challenges they have faced to rebuild the city’s reputation as a safe, fun and culturally enriching place to invest and visit. 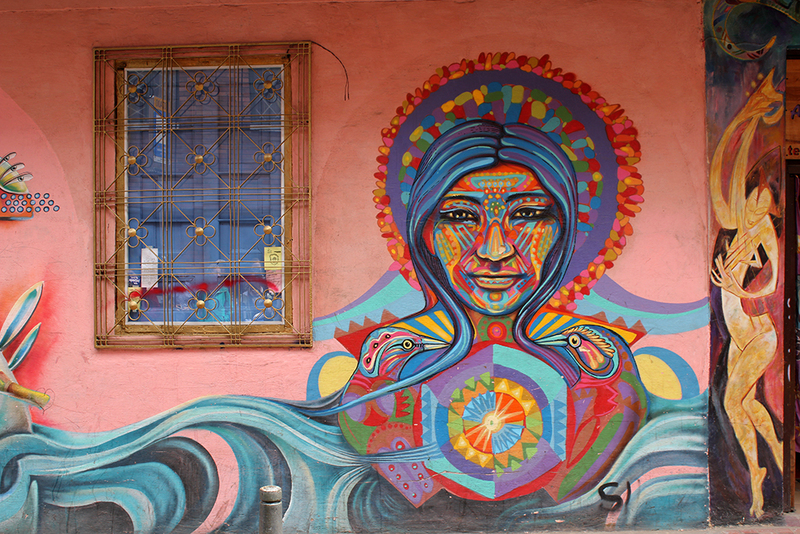 With two visits to Bogotá under my belt, I can confidently say that I never felt at risk or in danger. All the same standard travel best practices apply – do your research, be aware of your surroundings, don’t go into high-risk areas you’ve been warned about, etc. 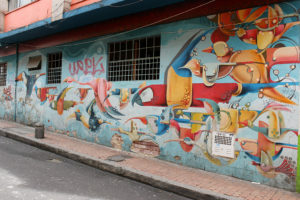 – but by and large, Bogotá is just like every other big, fast-paced city I’ve been to in the world, and the local Colombians were friendly and always willing to help. 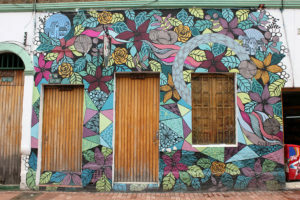 When most people think of South America, they think of warm climates – and while much of Colombia (like coastal Cartagena, for example) is hot, Bogotá is actually quite cool because it is at an altitude on a plateau in the center of the country, about 8,600 feet above sea level. We traveled in July, and the temperature averaged in the mid-50s. We needed sweaters and jackets. As always, check the forecast, read up, and pack for seasonal normals. For outlets, we did not need a plug adapter or power converter. Both times I visited Bogotá, transportation from the airport was arranged in advance – the first time with a large group it was two busses, the second time my colleagues arranged for a car service to pick us up. Getting through the airport, through customs and to the car was fairly simple, though I could see it being confusing if you don’t know much of the language. Just slow down, pay attention and follow the signs. If you do not have a car arranged, consider taking an Uber (below). All of my local friends and colleagues say that Uber is by far the safest and most practical way to travel around Bogotá. Everyone advises strongly against grabbing a cab off the street – they say they tend to be unsafe drivers, and at times, it can be a good way to get mugged. We used Uber a dozen times or more and had no trouble at all, plus we didn’t have to carry cash on-hand. One thing that struck us every time we took an Uber was how incredibly affordable it is compared to the U.S. At times we went all the way across town in traffic for 45+ minutes and the ride was still less than $20 USD. Note that your Uber driver may require you to sit in front with them, which may be different from where you come from. This is because they do not want to be identified as Uber drivers by taxi drivers, who are frustrated at the lack of regulation around Uber compared to taxis. My colleagues at the local branch of my office also arranged with the hotel for a car service to pick me up every morning which could be a great option for you – simply speak to the concierge or front desk at your hotel and they’ll take great care of you. 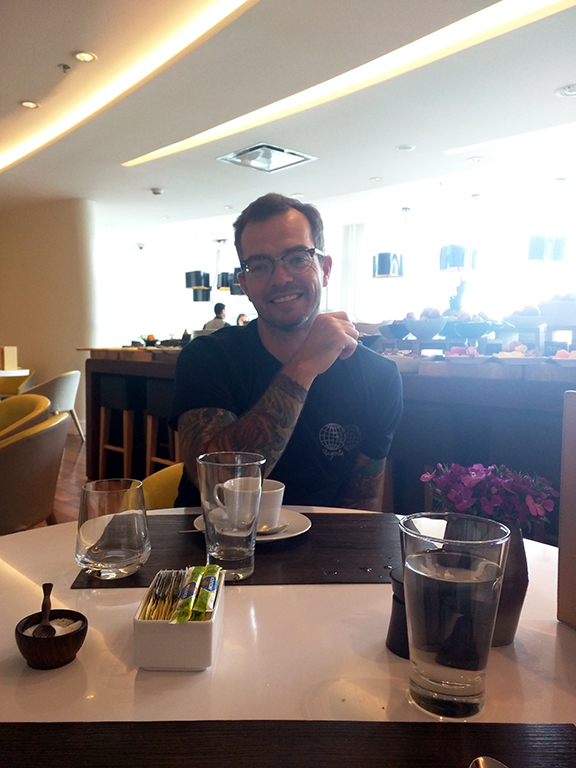 On my most recent trip to Bogotá, we stayed at the W Bogotá Hotel in the Usaquén district on the northeastern side of the city. We had a great experience – I definitely recommend considering it! The hotel was so upscale as part of the W chain, yet it cost less than what we would pay for a regular chain hotel in the U.S.
One funny thing – the bathroom stall and shower stall were transparent glass. No problem when you’re traveling alone, but when you’re lodging with someone else… well, let’s just say that was a new milestone in our marriage. So at the W, and both other places I have stayed in Colombia, they always have an amazing breakfast spread every morning with a huge selection of great foods including local fruit, bread and pastries, cheese, fish, nuts and seeds, yogurt, meats, cafe con leche – more than you could ever eat. The W also had a great concierge to take advantage of who would gladly make reservations if we had picked out a restaurant, had recommendations and lots of answers, safety tips, and could book a car to and from the hotel as-needed. My colleagues in Bogota are probably my favorite humans on earth. 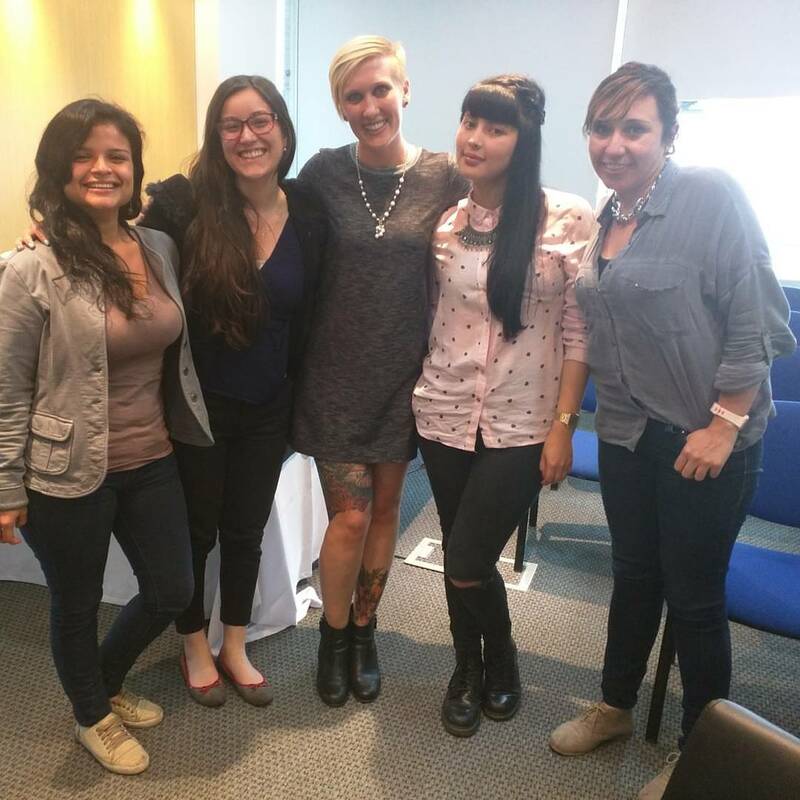 First, they asked me to come to the city for a week to lead workshops and teach them how to do what I do so they can develop a LatAm branch of the practice. My favorite detail was how thoughtful, polite and helpful everyone was to one another – down to the tiniest detail, like pouring coffee for one another. The thing I hoped most to “export” to the U.S. was their thoughtfulness. This photo is from the second floor of the VML office in Bogotá – I love the tops of those offices in the center! And this thing right in front and center of the photo? That’s a slide. You can slide to the first floor. So cool. The office has such a cool point of view, incredibly friendly people, snacks all day… every day they kindly served coffee, pastries, cheese, fruit, snacks throughout the day. One day my colleagues took me out for lunch to a Crepes & Waffles, and another day they brought a chef in to cater a paella lunch where we all ate together in the kitchen area. Some of my colleagues speak English more fluently than others, and it was a team effort to share and discuss the information, but everyone was a great sport and we had a lot of fun working through the interesting nuances of language to communicate with one another. Oh, and they also taught me swear words (like “no me jodas”) and had me repeating them for a long time before they told me what I was saying – so we had a great laugh at that. I really enjoyed getting to know everyone and spend quality time with them. 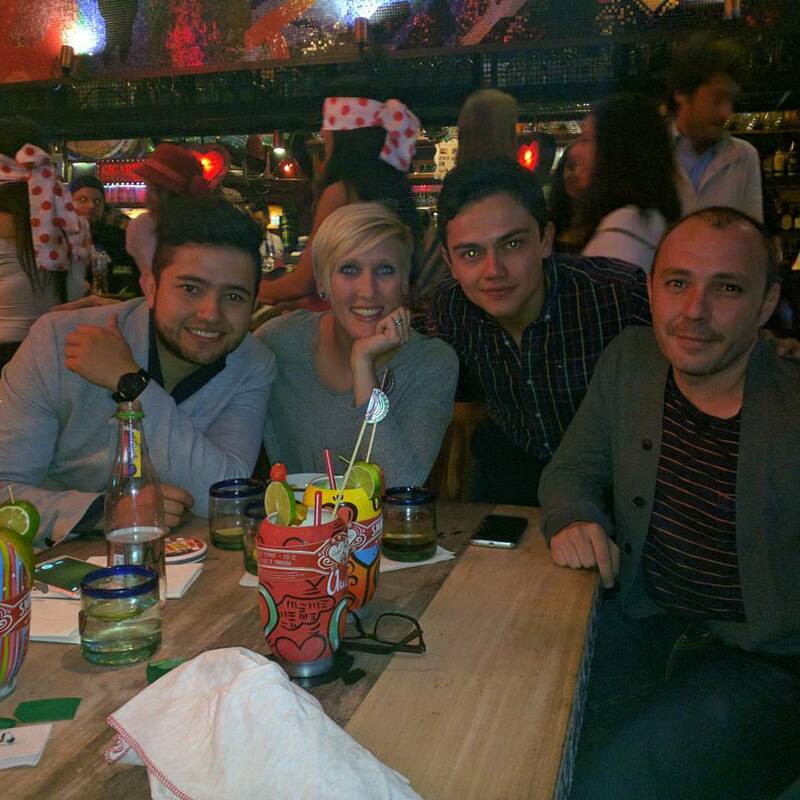 They graciously made time in the evening to hang out with us at Andrés (see below), and gave me tons of great recommendations to fully enjoy our time in Bogota. Juan Valdez Cafés are the largest chain of coffee bars in Bogotá (similar to Starbucks elsewhere in the world), where you can get a cup of Colombian coffee from one of the Juan Valdez baricultores. 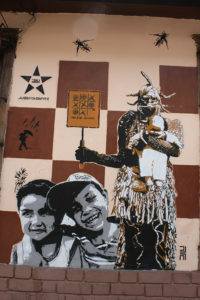 (Although the real Starbucks has opened a location in Bogotá using only local Colombian coffee beans.) 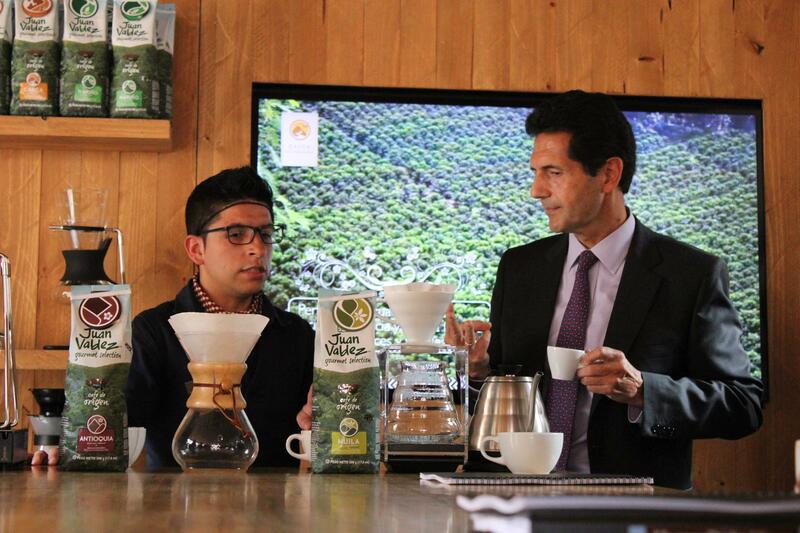 With somewhere around 175 locations in Colombia, you can find a Juan Valdez Café almost anywhere you go. 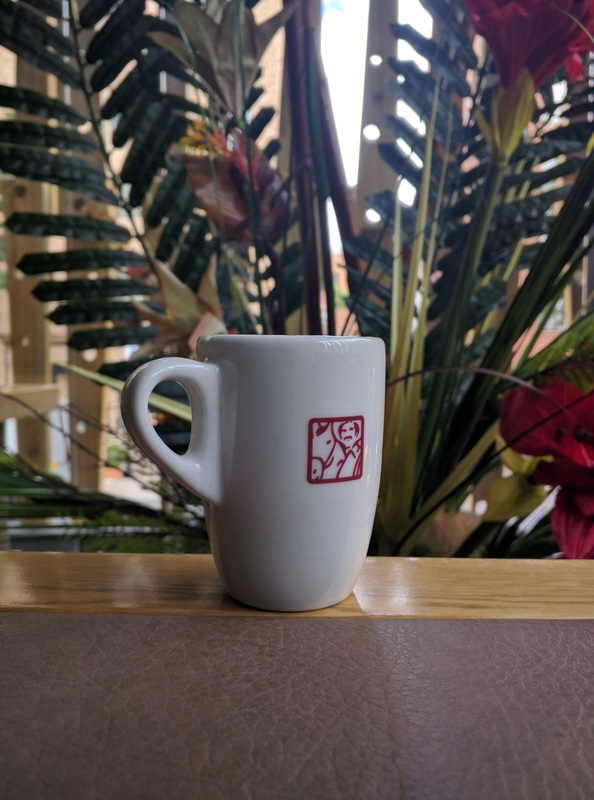 On my first visit to Bogotá, I went with an MBA group to a café location where Hernan Mendez, the President of Procafecol, educated us on the history of the brand, the role they play in Colombia’s national economy through domestic consumption and global export, and their international expansion. He also discussed how Procafecol was founded by the Federación Nacional de Cafeteros to create the Juan Valdez character and commercialize the brand. Mendez also led a tasting of a number of their different roasts and brews for the group. Parque de Usaquen is a small square of greenery near a number of local shops and restaurants, lined with street vendors selling art, jewelry, baskets and other local wares. 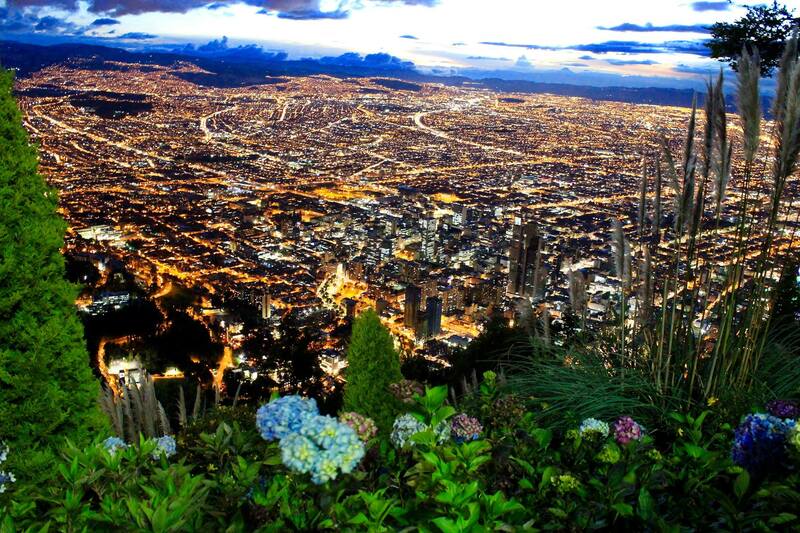 You must get a mountain view of the Bogotá skyline at dusk on Cerro Monserrate via cable car. 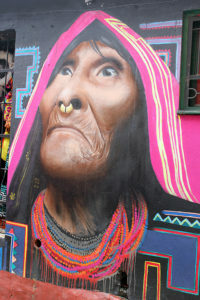 This is one of my favorite things to do in Bogotá – so enjoyable I did it both times I visited the city. It is a truly special experience I highly recommend working into your schedule. First, you head to the base of the mountain where there is a small tram station to buy round-trip tickets for the teleférico (cable car). At Cerro Monserrate you can take an easy Teleférico de Monserrate cable car ride to the top of a mountain, roughly 10,300 feet above sea level. 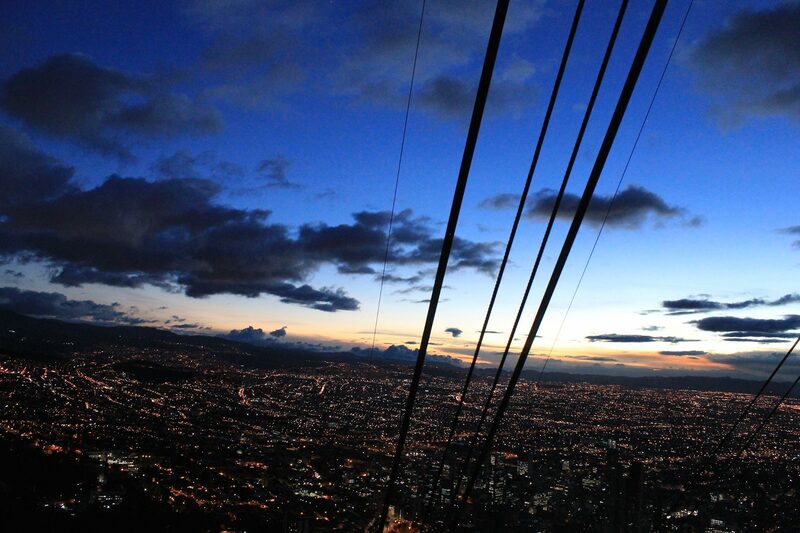 It is a glass car on a wire that allows you to look down at the beautiful Bogotá cityscape. The view faces west, so the best time to go is at dusk, where your photos can pick up the gorgeous blues and golds of sunset and the night skyline. Pro-tip: don’t be one of the obnoxious tram car passengers who tries to take flash photography from inside a reflective glass car. It doesn’t work and it ruins the experience for everyone. Flash off, folks. Awaiting you at the top is a monastery built in the mid-17th century, beautiful statues, and gorgeous views of the city. Monserrate is a tourist destination and also a popular site for a climbing pilgrimage to the sanctuary. Prior to the Catholic buildings introduced by the Spanish conquistadors, the mountain had temples of the indigenous Muisca people. It’s cool and breezy at the top of Monserrate at night, so bring a jacket. While you’re waiting for your dinner reservation, you will want to be warm as you walk the path through the 15 Stations of the Cross statues. Safety tip: Because the neighborhood next to the base of Cerro Monserrate is unsafe at night and mugging has been known to happen, our hotel concierge recommended hiring a car to take us to this spot, wait for us, and pick us up at the bottom of the mountain to return home. We took them up on that and it was a breeze. Do not let this nearby neighborhood dissuade you from visiting the mountain – your visit from the tram station to the top are very safe, and the view from the top is absolutely worth it. The hired car was surprisingly affordable – around $40 USD for the entire evening, we spent about three hours total plus the drive to and from our hotel. If you are looking for a classy, romantic dinner experience, consider the Casa San Isidro restaurant at the top of Cerro Monserrate. 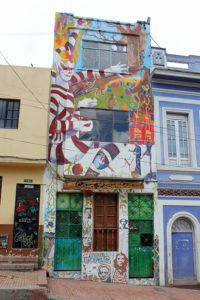 With a menu that changes seasonally, the restaurant has existed in Bogotá for more than 30 years. You will want to call ahead to Casa San Isidro to make reservations a few days in advance, and plan to block two to three hours for your visit. Following the charm of the mountaintop views, there is a nice bar inside the colonial building with a beautiful fire pit inside the restaurant that is a good place to pass the time if you happen to arrive earlier than your reservation. A live pianist performance also contributed to the ambience of the restaurant. 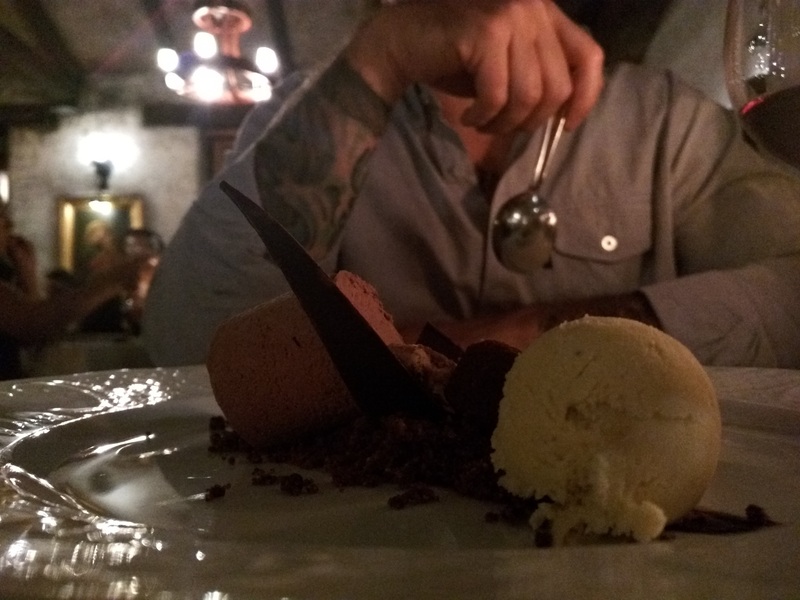 Between my husband and I, we enjoyed a bottle of red wine, a lobster entree, a beef entree and a dessert from their French-influenced menu all for around $100 USD. (On my prior visit we had a custom menu for the group that featured ceviche and a delicious seafood dish options and beef option.) 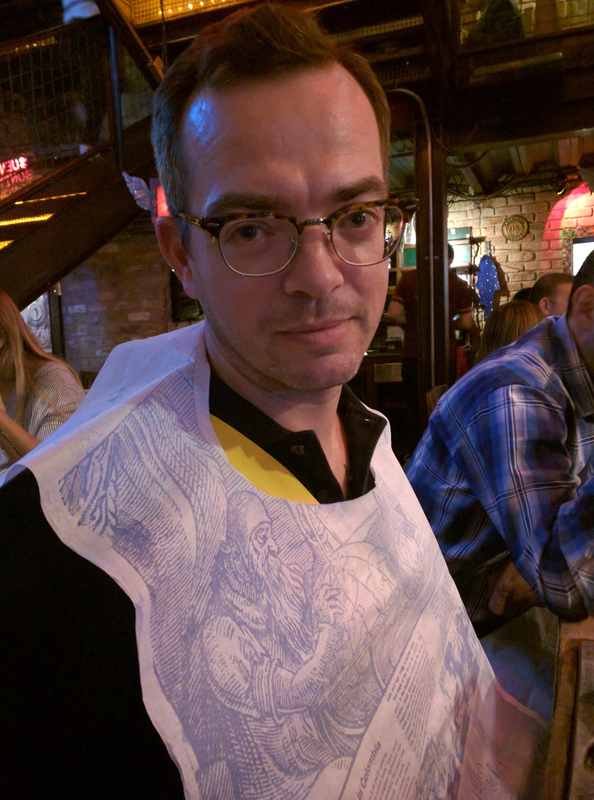 On this visit, my lobster was slightly overcooked, but otherwise the meal was perfectly executed. The service was top notch – attentive but not intrusive. When it was time for our dinner reservation – bar, fireplace, lobster, steak, bottle of wine, fancy dessert, all for around $100 USD. 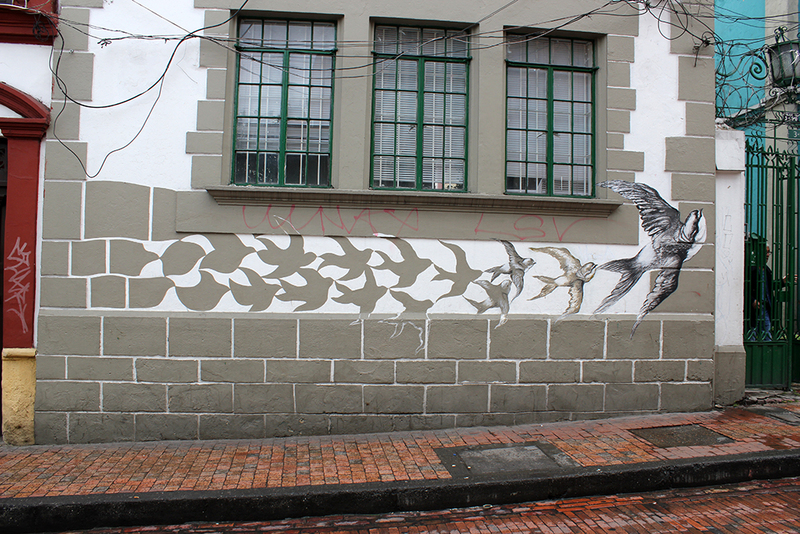 This is another spot I adored so much that I went both times I visited Bogotá. 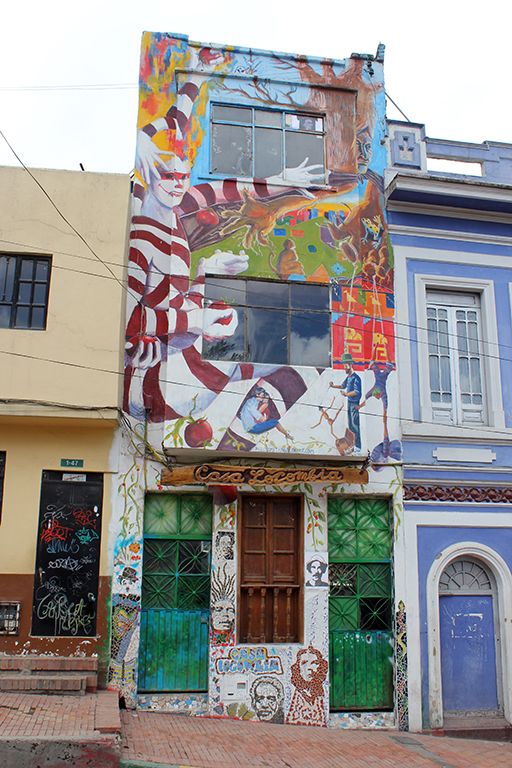 The Museo Botero is a completely open and free permanent installation in the Candelaria district. 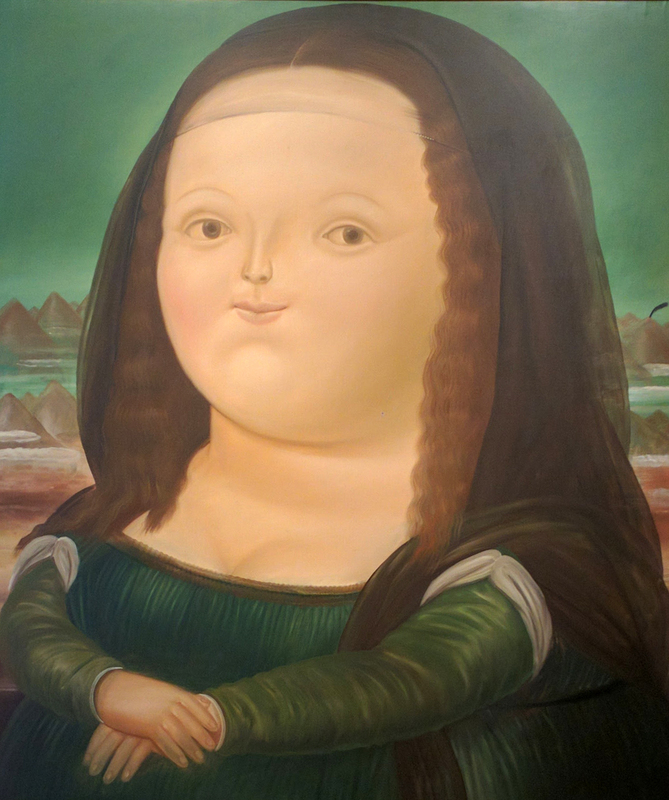 The Botero museum includes more than 100 of iconic Colombian painter and sculptor Fernando Botero’s original works, including his chubby rendition of the Mona Lisa, rounded caricatures, horse sculptures, and still life paintings. It also celebrates works from Botero’s personal collection and legendary artists like Salvador Dali, Joan Miró, Claud Monet, Henri Matisse, and Pablo Picasso. Immediately upon entering Museo Botero, you are greeted by a larger-than-life sculpture of a hand, and not far behind you can enter an immaculately maintained open air courtyard of hedges and a fountain. There are plenty of benches throughout the pillared colonial mansion to stop and rest, or just take in the calm atmosphere around you. Just behind Museo Botero is Casa de Moneda museum (Museum of Money) with a currency and coin collection worth checking out. 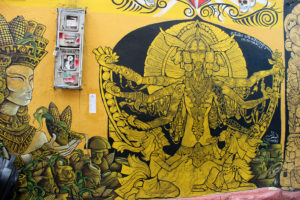 Within walking distance of these two spots are the Military Museum of Colombia, Miguel Urrutia Art Museum, and Luis Ángel Arango Library, which we did not visit. Prepare yourself for a loud, boisterous, entertaining adventure of an evening in the party atmosphere of Andrés DC. This restaurant is five Dante-themed floors filled with floor-to-ceiling all-over-the-place colorful décor and personalities and music and dancing. Their menu is massive and incredibly colorful, with each spread artfully designed. There is so much going on in this menu, it’s almost difficult to navigate. But I knew I wanted shrimp, coconut, and cheese – and I managed to get all three across a spread of different appetizers we ordered for the table. We ate stupid amounts of food here as we tasted our way through a variety of dishes, some excellent, most good, one memorably terrible, and had a great time doing it. It didn’t take long for wandering entertainment to approach us at our table and don us with colorful “Visitante Ilustre” banners. We were invited to stand up and dance – which we did (albeit poorly) – it definitely pushed me out of my comfort zone! The Museo del Oro was incredible and surprisingly enthralling. You would think that if you’ve seen 500 gold artifacts you’ve seen them all, but you would be wrong – this museum was so thorough that we spent almost four hours in this museum poring over every artifact and every detail. 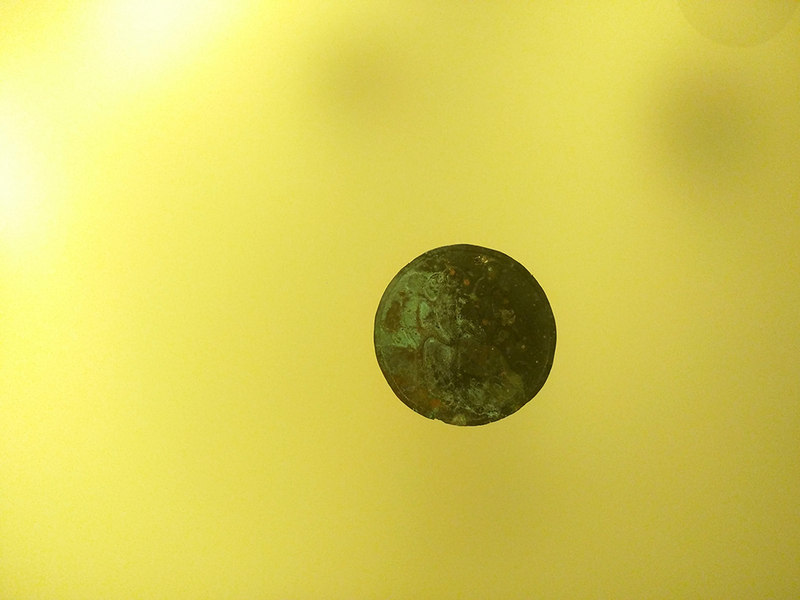 The Museo del Oro houses innumerable pre-Columbian gold, ceramic and stone artifacts for you to appreciate. Every corner we turned had more amazing history to be revealed and fall in love with. In fact, I was instantly obsessed with this tiny gold flying fish. 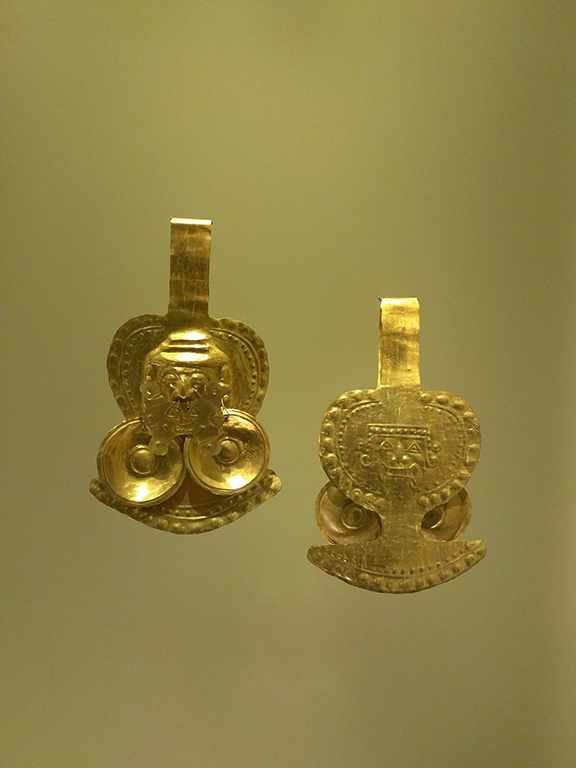 Among all the historical pieces in the Museo del Oro, this one – it couldn’t have been more than an inch and a half in length – caught my attention immediately and I could hardly pry myself away. It stuck with me so long after this trip I ended up getting a tattoo of it on the inside my left arm. After such a lengthy visit, there was a great gift shop and a quick café to snack and a drink to refuel. 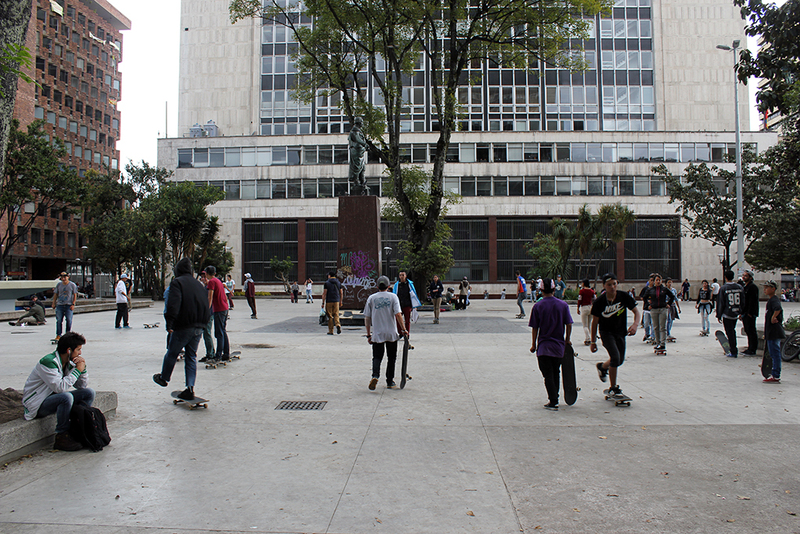 Right next to the gold museum was a plaza with dozens of kids skateboarding through the square. If you read reviews about Plaza Santander it describes it as dirty, ugly, boring. 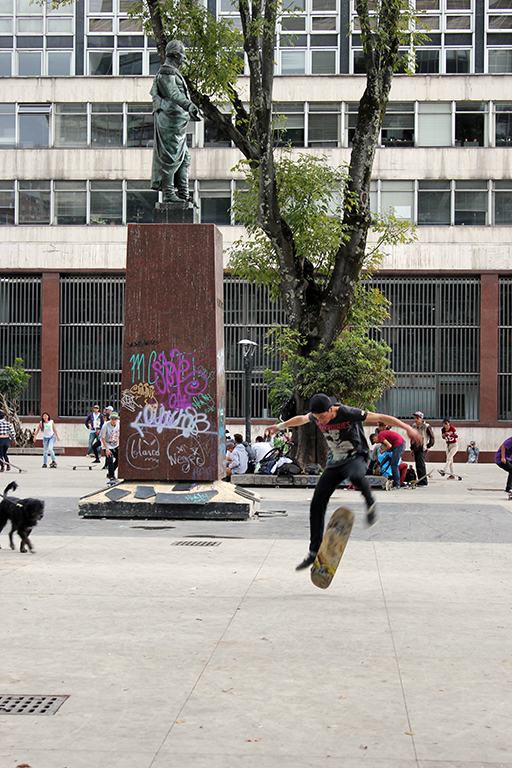 But I beg to differ – this square wasn’t designed to be a tourist hot spot, and it happens to be a place where locals spend quality time doing the things they love. As a skateboarder, my husband particularly appreciated kicking back and soaking in this local flavor. 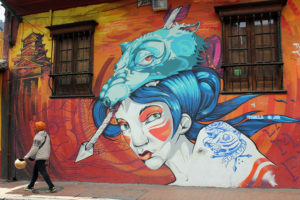 We wanted to see a different side of Bogotá, and inspired by my travel partner’s interest in street art and city culture, I sought out the Bogotá Graffiti Tour. It is a roughly two-hour walking tour through the Candelaria district to experience the local art fueled by creativity and beauty, history and politics. 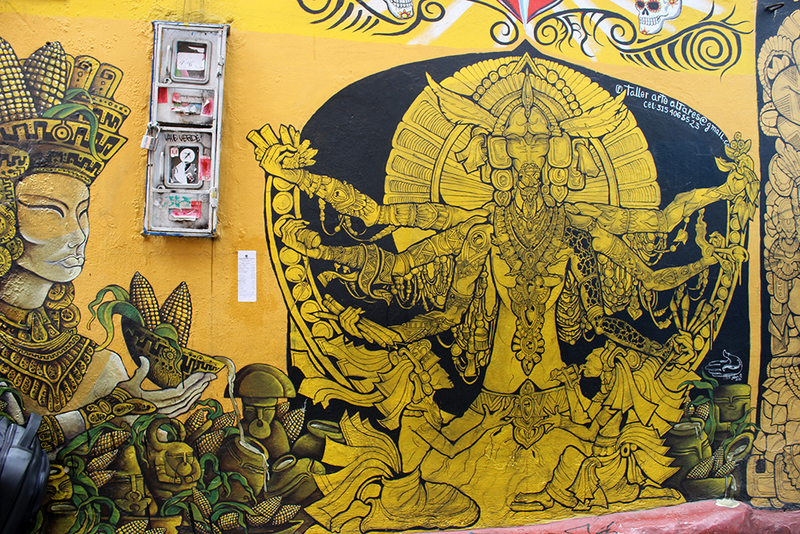 The Bogotá Graffiti Tour was started by Australian and Canadian graffiti artists 2011 to share the urban art scene and promote local artists. While it is free to reserve a spot on the tour, it is recommended to donate 20.000 to 30.000 pesos ($7-10 USD) per person to the tour guide. We met our tour guide, a German expat, at the Simon Bolivar statue at Parque de Los Periodistas around 10 a.m. on a damp day in the city that alternated between misty rain and breaks of sunlight. So bring both your umbrella and your sunglasses. 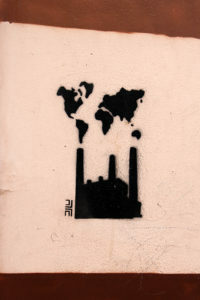 Honestly, I can’t begin to sum up how cool and enlightening this walking graffiti tour was – we had such a great time, and I can’t recommend enough that you experience it for yourself. In lieu of an inadequate description, check out some of the photos below. After our graffiti tour, we thoroughly enjoyed wandering the streets of the Candelaria District and checking out more painted and graffiti street art on the sides of homes and businesses on our own. It was great just to be on the ground in the city, people watch, and pop our heads into shops here and there. We happened to be visiting over Colombian Independence Day, a national holiday, so I had the day off from work with the rest of my colleagues, and we got to explore the city. In the part of town we were in, there was a parade through city streets with lots of vendors, live music, dancing, and food. We walked about two miles to the Colombian National History museum – apparently this building used to be a prison before being converted into the Museo Nacional de Colombia, one of the oldest museums in the city. 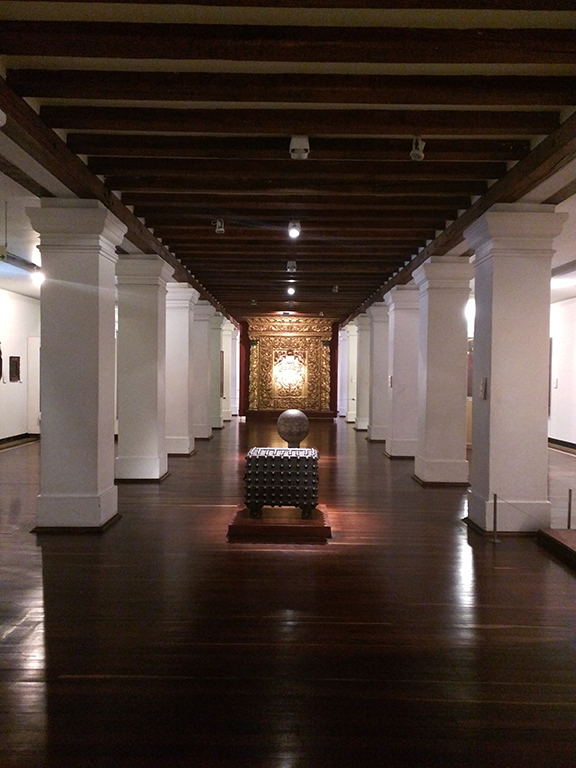 The museum is organized by timeline of periods in history. 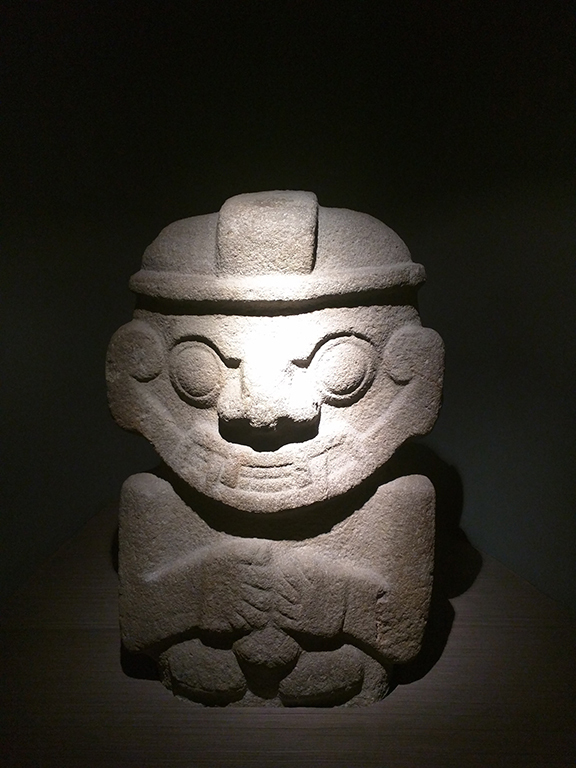 The signage is almost all in Spanish, so at least a basic, working knowledge helps to navigate the museum’s contents – mainly archeological artifacts and art. One of our last stops on our Bogotá visit was dinner at Criterion, one of the restaurants of Chef Jorge Rausch and his brothers. 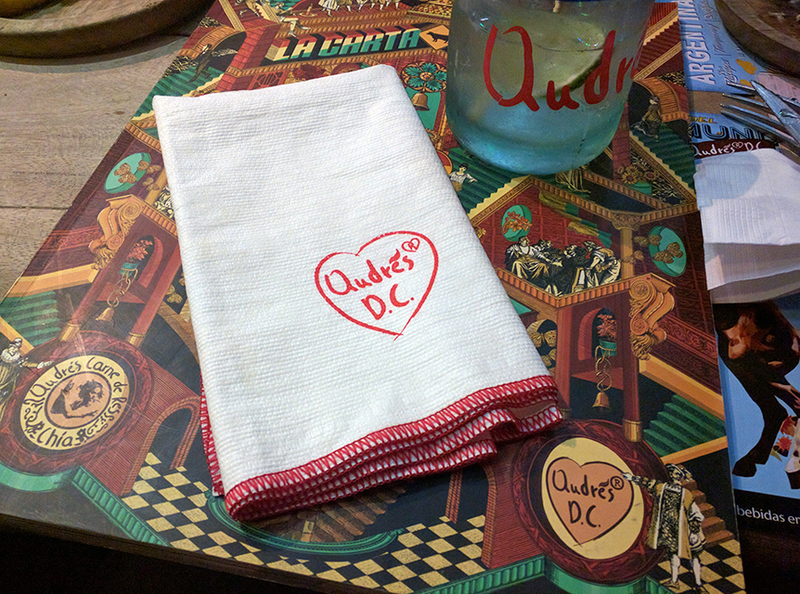 The brothers own several restaurants across Colombia. While the decor in the part of the restaurant we were in seemed artificially fancy for the caliber of the food and stylishness of the neighborhood, we really enjoyed our meal here. Chef Rausch even made time to stop by our table and ask about our meal and wish us well, which was an appreciated added touch. We started our meal with a bread basket with salted butter, and a bottle of red wine. I believe my husband had the Boeuf Bourguignon while I had the shrimp with coconut and saffron sauce. We enjoyed one of their lighter desserts with raspberries, cream and meringue. We did not try their renowned giant cross-table tasting of more than a dozen miniature desserts, but it was a delight to watch them put it all together for other tables. 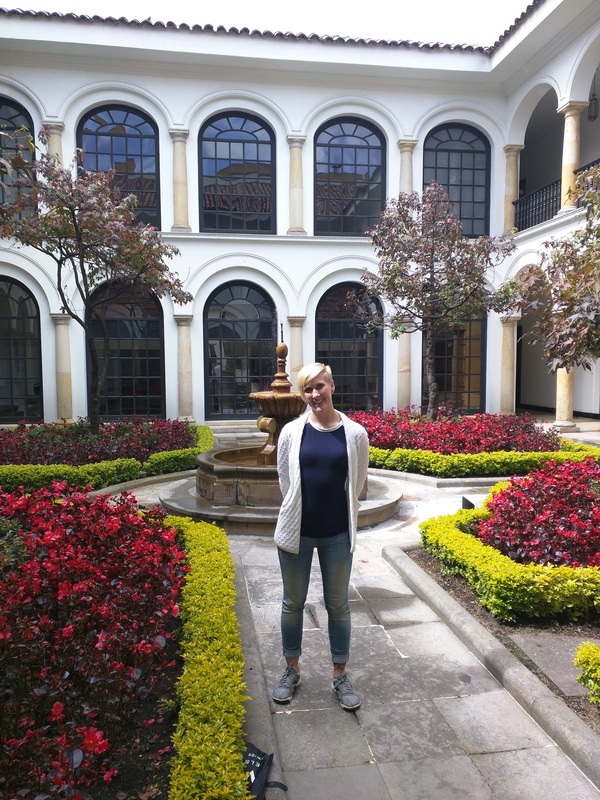 I had such a wonderful time in Bogotá on both visits, so much so that a few places I even revisited on the second time around. 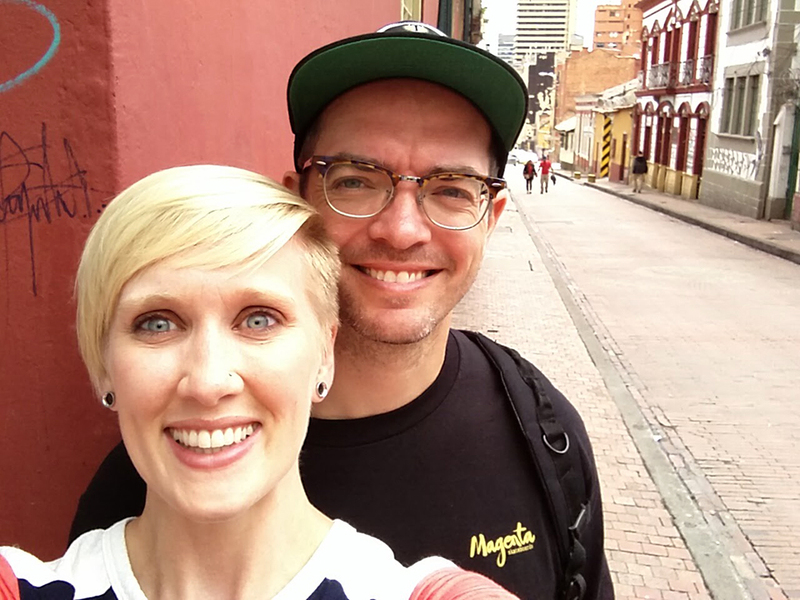 But despite having spent almost 10 days in Bogotá over the course of the two visits, I still feel that I have barely scratched the surface of what this amazing city and these wonderful people have to offer. I appreciated the sights and sounds, the tastes and smells, the music, the conversation, the culture, and it only made me want more. If you were on the fence about visiting Bogotá before, please take my highest recommendation that you visit this city as soon as possible!